Previous PostRound 3 Matches To Take Place Tomorrow!Next PostRound 5 Starts Tomorrow! We will know the winner of the 1930s era by next week! Incredible review. I loved the part where Rosalind Russell spoke fast. OK I am probably biased since His Girl Friday is my all time favorite movie but what the hell….that was the best review I have read in awhile Desiree! A phenomenal job and I love all the tidbits you threw in there about the back stories and such. I may have been one of the few who didn’t know about Cary playing matchmaker for Rosalind.Sweet. Loved all the photos you chose and placed through-out your review. Excellent work Desiree! Just amazing! I think I will run out of superlatives here in a minute but I really did love this review. And I can tell you enjoyed writing it too! Your reviews keep getting better and better! I love your description of Hildy’s “ziggity-zaggity” suit. Poor Hildy. She wanted her life to go one way, but it went another, just like the lines on that outfit. You’re 100% right–I can’t imagine anyone else playing Hildy with such heart and charisma. I love this movie.True comedy .Love the stars . It’s a great one, Vickie! Wow, you really out did yourself this time. Your lead photo set up your review beautifully. The quotes beside the wonderful pictures brought the movie to life. The back stories are so interesting and make Roz even more memorable. 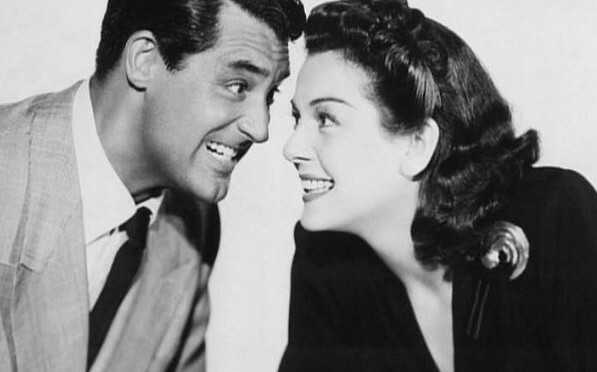 His Girl Friday is such an iconic film and the casting of Rosalind Russell and Cary Grant is inspired. These two actors are so well matched. They both are great in comedy, drama, and suspense roles. Carey & Roz are each tall, slim, good looking and they both look great in suits, what more could you want. From the suits to the versatility to their great looks, Roz and Cary were a perfect match. It’s such a shame they were never paired up again. Katherine Hepburn just had to go and be a Cary hog, I guess!